Jean Logan is an ordained minister of Universal Brotherhood, has a doctorate in Holistic Nutritional Healing and is a student of many types of energy healing. She is president of Holy Ground Farm, Inc., a non profit that supports the education of children. She is the author of Unlocking the Power of Glyphs, Sacred Symbols of Light, Symbols of the Dawn and Sacred Symbols Healing Cards with profits dedicated to charity. She has been a conscious channel for many years. Allen has work with children for many years, teaching, guiding and nurturing them. He also has an extensive background in Agriculture. 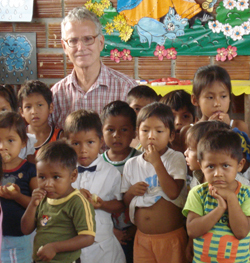 Dean Logan, our man in Peru, is President of our affiliated non-profit, Los Niños Del Inka (LNDI), of Iquitos, Peru. Cathy Carter is our associate working with the Happiness Orphanage in Nepal. Cathy is President of Leilotus Fashions from Nepal. Our man in Nepal, David Carlson, does research for our charity work. Thanks David for doing such a great job. David is a network engineer for the Sprint Corporation. Patrick Carlson has an extensive knowledge in print and online media. He has a prior background at notable advertising, graphic, and corporate communications companies. He brings an unparalleled depth of experience in marketing to Holy Ground Farm.